The Smokehouse Ramblers were formed by three blues loving musicians, all busy and active in other blues bands. We decided to put together a very special side project in the form of a lighter-volume blues trio, the kind of band that you can listen to and enjoy while eating a fine meal and sharing dinner conversation with a few friends. The goal of the project was to provide quieter, soulful blues covers and original tunes while at the same time not forgetting the real reason for playing the blues which was just to have a hell of a lot of fun. Our debut CD, "Can't Get Used To It," is a collection of our original songs with a couple of our favorite tunes thrown in as well. 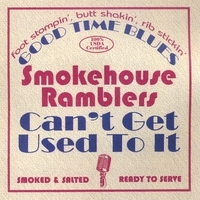 "Can't Get Used To It," the debut CD from the Smokehouse Ramblers shows how three veteran blues musicians can use their talents...with good songwriting, tight arrangements, and musical ability to deliver a quality listen. The Smokehouse Ramblers are; Steve Cocchi, a solid guitarist and multi-instrumentalist, Tom Mallafarina who exhibits total command of his instrument on bass, and Buddy Cleveland on blues harp whose picture is apparently in the Webster's Dictionary next to the word virtuoso. I rarely, if ever, use this word to describe anyone but Cleveland combines the three T's, Talent, Taste and Tone, to deliver stellar performances song after song. Of late, it seems every harmonica player wants to emulate John Popper's over-played chromatic flights of narcissism but Buddy Cleveland has such a knack for putting exactly the right note in the right place and has such command over the tone of his instrument that his playing alone makes this CD worth the price. Blues shuffles, country blues and slow blues abound in a mostly acoustic format making for a relaxing listen, (take this thing for a drive and watch the 'road rage' just melt away)..."Can't Get Used To It" is a solid debut from three quality blues musicians who, though they've been around for a while, seem as if they're just getting started. [B]lues trio Smokehouse Ramblers has released its first CD, “Can’t Get Used To It” filled with an hour of barnstormers and slow jams, originals and covers. The band’s specialty is lighter-volume blues music “The kind…you can listen to and enjoy while eating a fine meal and sharing dinner conversation with a few friends” according to its Web site. To that extent, the trio lacks a drummer, relying on sparse percussion – a tambourine slap here, a hi-hat cymbal there – and Tom Malafarina’s bass to anchor the beat. That approach works best in the extended, slower numbers, as the added atmosphere allows vocalist/harp player Buddy Cleveland and vocalist/guitarist/percussionist Steve Cocchi to stretch out and fill in the space with inspired solos. The majority of the 10-songs album is made up of originals, with an Elmore James cover and a Keb’ Mo’ cover completing the set. The arrangements are given room to breath, with most of the songs lasting well over five minutes, and the disc feels like it was recorded at a live show – a good sign of a road-tested band. For those who like their blues harp-heavy and fun, there’s a good chance you can get used to the Smokehouse Ramblers. I was never a big fan of "acoustic" music, but these guys make it fun. We are lucky enough to often sit and have dinner while listening to this group and wish all our friends could join us. "Madison Blues" is probably my favorite, but now that I have turned 65 I think I will adopt: "Past My Prime" as my theme song.